This cartoon was originally posted on JenSorensen.com on November 09, 2015 and the TheDailyKos on November 10, 2015. Reprinted with permission. About the Author: Jen Sorensen is a political cartoonist, writer, and graphic journalist. Her work has appeared in the Village Voice, LA Times, Ms. Magazine, The Progressive, NPR.org, and alt-weeklies around the country. You can find more of her work here. In today’s era of Big Data, analytics, and sabermetrics, the cheeky motto “in God we trust, all others must bring data” has never seemed more relevant. Well, in the arena of mandatory arbitration provisions in consumer contracts the data is in, and the verdict is clear: mandatory arbitration is unfair to consumers and harmful to the public interest. I’ll briefly outline the results, but what was really interesting – and what I’ll discuss below – is the discussion among panelists at the hearing Tuesday. Mandatory arbitration clauses affect tens of millions of Americans. In both the credit card and checking account sectors, half of all accounts were covered by such provisions. The CFPB estimates that 80 million credit card holders are subject to mandatory arbitration. Consumers don’t know they’ve signed away their rights. In a survey conducted for the report, 75% of consumers did not know whether they were subject to mandatory arbitration clauses. Of the 25% who thought they did know fully half were wrong about the true nature of the contracts they had signed. The survey also revealed that only a small fraction of consumers actually understand what mandatory arbitration and class action bans really mean for their rights. Consumers rarely act on an individual basis. Over a three-year period, consumers filed only 1,800 claims in arbitration and 3,500 individual claims in federal court. Evidence from small-claims courts showed that individuals rarely turn to that forum for redress, and that most activity in those courts was by companies filing debt-collection suits against consumers. Consumer class actions work. Over a five-year period 420 class action settlements in federal court netted $2.7 billion in cash, fees, and other relief. Contrary to the familiar protests of industry advocates, only 18% of this money went to plaintiffs’ lawyers, meaning $2.2 billion accrued to the benefit of affected consumers, with approximately half paid directly to consumers in cash payouts. These settlements benefitted at least 34 million consumers across America, not to mention all those protected by the settlements’ deterrent value. 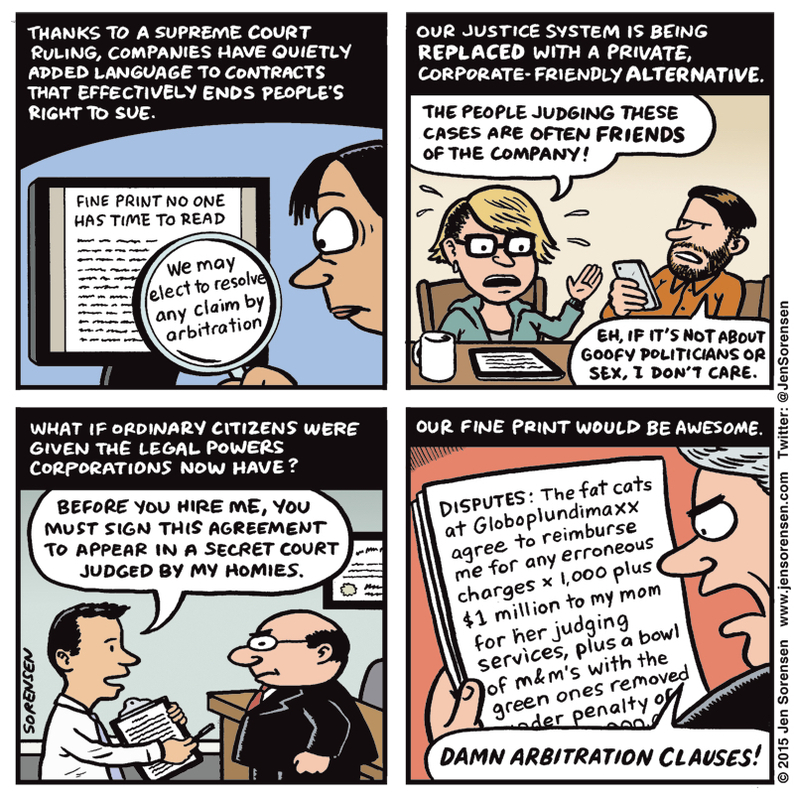 Companies use arbitration clauses to kill class actions. Companies rarely invoke arbitration clauses to move individual suits out of court. In contrast, such provisions are raised in nearly two-thirds of class actions, and almost all arbitration clauses prohibit class treatment in the arbitral forum. Arbitration does not make financial services cheaper for consumers. There is no evidence for the claim that arbitration clauses make the cost of doing business cheaper for companies who pass those savings onto consumers. Indeed, after four large credit card issuers removed arbitration clauses from their form contracts under an antitrust settlement, they did not significantly increase costs or reduce access to credit compared to other unaffected companies. At the hearing in Newark, Director Cordray’s overview of the report’s findings was followed by a panel discussion between advocates for the financial industry and consumer protection advocates, including Public Justice Executive Director Paul Bland. Given the reams of empirical data contained in the report, the industry-side panelists had little ground to stand on. Their responses consisted largely of nit-picking about the report’s methodology and doubling-down on their belief that arbitration is cheaper, faster, and fairer for consumers. For example, Ballard Spahr attorney Alan Kaplinsky cited “studies” and his own “personal experience” representing financial institutions to back up these claims. , but did not cite any specific study by name. . He protested that it’s too early to judge how consumers fare in arbitration compared to court because arbitration is “in its infancy,” ignoring the fact that the report analyzed three years’ worth of data from the nation’s largest arbitration provider. He also raised the familiar bugbear of the predatory plaintiffs’ bar, which reaps untold profits from “frivolous” lawsuits without any real benefit for their clients. His most intriguing comment, if only for its irony, was that his clients in the financial sector are regulated well enough by the CFPB and other federal and state agencies. Leave enforcement to government actors, he argued, they are far better at protecting consumers than the private sector. Probably the most interesting comments from the industry side of the aisle came from Louis Vetere, president and CEO of a New Jersey credit union. Though he also did not grapple directly with the report, he agreed with his ideological colleagues that arbitration was good for consumers. However, he also repeatedly clarified that his company did not mandate arbitration in its contracts, nor did it think doing so was proper. Rather, he preferred to offer arbitration as an option when disputes with depositors arose, ultimately accepting whichever forum the depositor felt most comfortable with. The panel’s consumer advocates fired back on several fronts, refuting both the specific arguments made by the industry advocates, and pointing out the many systemic problems caused by mandatory arbitration. Jane Santoni, a consumer lawyer in Maryland, said that arbitration was never a better option for her clients. More troubling to her was the fact that she has had to turn away the majority of prospective clients who have meritorious claims because as individual cases they are simply untenable for her to take. From her perspective mandatory arbitration has an “astronomical chilling effect” on the civil justice system. Myriam Gilles, professor at Cardozo School of Law, noted that deciding consumer law cases in the “hermetically sealed” forum of private arbitration rather than in public court proceedings undermines the common law system in which future decisions build upon past precedents. She also pointed out that companies put mandatory arbitration clauses in their contracts because it’s in their interests and is a matter of “common sense” from their perspective: as the report clearly bears out, arbitration is not about dispute resolution. It’s about avoiding liability. Public Justice’s Paul Bland drove this point home in his remarks, noting that the innocent-sounding claim that arbitration is just about moving disputes to a simpler, easier forum is a “fairy tale.” He noted that mandatory arbitration prevented consumers from protecting themselves, particularly as marginal financial actors such as payday lenders move their practices online, burying arbitration agreements in tiny-text terms and conditions on obscure webpages, all to avoid answering to consumers and government overseers when they violate consumer protection statutes. Mandatory arbitration does little more, he argued, than permit companies to break the law with impunity by taking away people’s basic constitutional and statutory rights via mouse print contracts. The hearing closed with comments from the assembled audience. Dozens of consumer advocates stood up and added further arguments against the use of mandatory arbitration. The points raised were remarkably varied, ranging from the practical – poor consumers can’t even afford the AAA’s $200 filing fee – to the theoretical – pre-dispute arbitration agreements violate consumers’ First Amendment right to petition for redress in a government court. One common refrain in the public comments, made in response to industry panelists’ claims that consumers enjoy the simplicity and informality of arbitration, is that if arbitration is such a good deal for consumers, it should be offered as a choice rather than being forced upon them as a condition of signing up for a credit card, cell phone or car loan. Now that the data is in, the CFPB will soon announce what, if any, action it should take to regulate the use of mandatory arbitration provisions in consumer financial services contracts. Given the content of the report, the wealth of arguments supporting its conclusions, and the empirically bankrupt arguments from the other side, it is hard to imagine that the Bureau won’t come down hard on these clauses, perhaps even banning them outright. We here at Public Justice certainly hope that it does. This post originally appeared at http://publicjustice.net/content/cfpb-hearing-data-one-side-empty-rhetoric-other. Reprinted with permission. 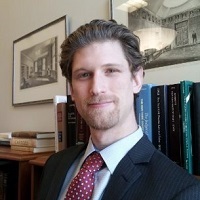 About the Author: Gabriel Hopkins joined the Public Justice DC Office in September 2014 as the Thornton-Robb Attorney. Before joining Public Justice he spent a year clerking on the New York State Court of Appeals for the Honorable Susan P. Read. 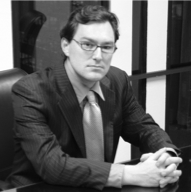 Gabriel attended New York University Law School and received his J.D. in 2013. While at NYU he worked with attorneys from the New York Civil Liberties Union to sue the New York Department of Corrections over its unconstitutional use of solitary confinement to discipline prisoners, securing significant relief from this practice for minors and the mentally ill in the prison system. He also summered at the New York Attorney General’s Civil Rights Bureau, and the Los Angeles civil rights firm Schonbrun DeSimone Seplow Harris & Hoffman, where he helped partner Paul Hoffman bring the landmark international human rights case Kiobel v Royal Dutch Petroleum to the US Supreme Court. But welcome to 2014 America’s legal system, where the prevailing rule is that forced arbitration provisions are so favored by current law that they’ll be enforced even in situations where 1,000 people out of 1,000 would NEVER have imagined that they would be enforced. The Supreme Court’s jurisprudence of arbitration plays out, once again, as being wildly unfair and counterintuitive. It’s an outrage, but just one of far too many. About the author: F. Paul Bland, Jr., Executive Director, has been a senior attorney at Public Justice since 1997. As Executive Director, Paul manages and leads a staff of nearly 30 attorneys and other staff, guiding the organization’s litigation docket and other advocacy. Today the Department of Defense (DoD) issued a new proposed rule expanding important protections to servicemembers and their families from predatory lending. The new rule closes the loopholes in the Military Lending Act (MLA) that allowed many financial services to fall outside the scope and protections of the law and put servicemembers at financial risk. In 2006, the DoD reported to Congress that “…predatory lending undermines military readiness, harms the morale of troops and their families, and adds to the cost of fielding an all-volunteer fighting force.” In response in large part to the DoD report, the MLA, bipartisan legislation passed by Congress and signed by George W. Bush in 2007, capped interest rates at 36 percent and applied other key consumer protections to certain forms of credit. Unfortunately, the MLA only covers a narrow subset of payday loans, auto title loans and refund anticipation loans and unscrupulous business often founds ways around the law. We applaud the DoD’s new proposed rule to expand the current military financial protections and the ban on forced arbitration to a wide range of high-cost loans made to active-duty servicemembers and their dependents. We hope the Consumer Financial Protection Bureau (CFPB) follows the lead of the DoD to protect all consumers – both military and civilian. The CFPB is required by the Dodd-Frank Act to study the use of forced arbitration and is authorized to issue a rule to limit or ban forced arbitration in all consumer contracts for financial services and products under its jurisdiction. We encourage the CFPB to write a strong rule to eliminate forced arbitration clauses for the benefit of all consumers. Great news Monday. The Consumer Financial Protection Bureau can finally continue a crucial study on the effects of forced arbitration on consumers. Under the Dodd Frank Act, the CFPB has to complete a study as to whether the use of forced arbitration clauses by lenders is harmful to consumers. If the Bureau finds that forced arbitration is harmful, then it is required by the act to ban the use of forced arbitration by lenders. We, among some others, had urged the Bureau to weigh the fact that very few consumers know anything about forced arbitration. While the clauses are justified under a bunch of rhetoric that consumers have supposedly agreed to them, in fact almost no consumers know about the rights they’ve supposedly waived. The Bureau decided it wanted to do a survey of consumers to find out what they do and don’t know about arbitration. Anyhow, the consumer survey appeared to be slowing things down, because the Office of Management and Budget (picture the little trolls in Dilbert who work in accounting, slowing down everything and killing every good idea) was taking forever to approve this simple survey. The roadblock has been lifted – the OMB has FINALLY gotten out of the way. This blog originally appeared in Public Justice Righting Wrongs on September 10, 2014. Reprinted with Permission. Employers may be reluctant to admit that their policies are designed to shut workers out of our civil justice system. But there is no denying their intent. Consider this example. Elizabeth is a widow with five children who came into my office this spring. Since the death of her husband a few years ago, she immersed herself in her work to provide for her family. Elizabeth didn’t earn much at her job, but her work as a waitress was enough to support her children. She had been working for a California-based restaurant chain for nine years. During a Friday shift last year, Elizabeth was informed about a new kind of company policy – an arbitration agreement that she was told she had to sign and return by Monday. Elizabeth tried to find an attorney over the weekend to explain the document to her, and when she couldn’t, she asked her employer for more time to review the agreement. She was fired a few days later for missing the 72-hour deadline. The company also fired several other employees for either declining to sign the arbitration agreement or not doing so by the company-imposed deadline. I often see aggrieved employees who have signed arbitration agreements without understanding the content or the significance of the document. They sign the documents that their employers put in front of them, in order to continue working and to feed their families. In fact, most workers don’t learn what the term “arbitration” means until they consult with an attorney and learn that they have already signed away their right to seek justice in a court. But the compulsory nature of these arbitration agreements is undeniable when we look at the employees that don’t blindly “agree” to an employer’s mandatory arbitration policy, or those like Elizabeth who merely ask for time to conduct a careful review and to consider their rights before agreeing to sign them away. If there was any question whether such “agreements” are a condition of employment, Elizabeth’s experience offers the answer. Are we beginning to see the end to these extreme practices? On July 31, President Obama signed an executive order prohibiting certain federal contractors from forcing their employees out of court and into arbitration in workplace discrimination cases. Although this executive action is a step in the right direction, it does not go far enough. Congress continues to ignore this systematic denial of justice to our workers by failing to move forward on the Arbitration Fairness Act, which has been pending since last year. The Act would ban forced arbitrations in employment and consumer settings. Until workers have a real choice in deciding where to claim their rights, the scales of justice will remain unbalanced. This blog originally appeared in CELA Voice on August 26, 2014. Reprinted with Permission. http://celavoice.org/category/afshin-mozaffari/. About the Author: Afshin Mozaffari is the founder and principal of Mozaffari Law. Mr. Mozaffari’s practice focuses on civil rights and employee rights litigation, including discrimination (based on race, religion, color, national origin, ancestry, physical or mental disability or medical condition, marital status, gender, sexual orientation, age, and pregnancy, childbirth or related medical conditions), sexual harassment, retaliation, disability accommodation, wrongful termination, and wage & hour. Prior to the founding of Mozaffari Law, Mr. Mozaffari represented numerous corporations, schools, and non-profits in employment law, torts, business litigation, and class action cases. He recently left the defense side to follow his long-held passion for representing the rights of employees and other individuals. Cliff Palefsky of McGuinn, Hillsman & Palefsky disputes the assertion that sending a case to arbitration has no impact on substantive rights; that faulty premise, he contends, underlies much of the Court’s arbitration jurisprudence. The Supreme Court has told us repeatedly that judges do not create public policy. Public policy, they say, must emanate from the Constitution or a statute passed by Congress. Docket clearing is not a public policy and the FAA did not and could not create a public policy that conflicts with the express mandates of the Constitution. But if the goal of the Supreme Court’s jurisprudence on arbitration was to fulfill its judicially created public policy of “docket clearing,” it has failed. In the past few Terms the Supreme Court has heard at least eight significant arbitration cases. Courts of appeals across the country are inundated with arbitration issues and trial courts are hearing contested motions to compel arbitration on a daily basis. The reasons are obvious. Arbitration was always intended to be a voluntary process, or as the Court itself has declared, a matter of “consent and not coercion.” It says that but it doesn’t really mean it. And parties who do not want to arbitrate and who do not trust the forum designed and imposed on them by a stronger party will use all available legal tools to avoid it. The mere act of forcing an arbitration program that you designed on an adverse party is inconsistent with the confidence in the process any justice system needs to succeed. As a result of failing to distinguish between voluntary and coerced arbitration in its jurisprudence, the Court has actually dramatically increased the workload of the appellate courts and done serious damage to the Constitution and many of the most important laws passed by Congress. But equally important, and ironic, is the fact that by further eliminating the safeguards of a fair arbitration process as the Court did this Term in Concepcion and last Term in Rent-A-Center v. Jackson, the Court has actually undermined the viability and integrity of the arbitration process and in doing so has done great harm to the credibility of all of the effective voluntary forms of ADR which might actually help provide more efficient justice to so many and help reduce the backlog in the courts. Real consent was always intended to be the only check and balance necessary to ensure fairness and to keep these matters out of the courts. By ignoring and distorting the requirement of consent, the Court has opened the door to every permutation of abusive and unfair arbitration process. As a fundamental concept, you can’t turn an adversarial system over to one side and invite it to design and control the process. It is thus no surprise that the abuses are getting all the attention and all of the positive attributes of voluntary ADR processes are lost in the noise. It is easy to identify some of the ways in which the Supreme Court lost its bearings. It is also pretty easy to identify ways to make their future jurisprudence more faithful to the Constitution and restore the promise of voluntary forms of ADR. It would be malpractice for any lawyer to tell a client that arbitration and our public court system are equivalent fora. Indeed, they are exact opposites in every material defining characteristic – public versus private, free versus costly, full discovery versus limited discovery, obligation to properly apply the law versus legal errors must stand, appeal versus no appeal. Arbitration is not just a change of venue, and it is not “just another forum”. And pretending that it is is the modernday version of “separate but equal”. The assertion that sending a case to arbitration has no impact on substantive rights is simply false as a matter of fact, yet that is the essential underpinning of much of the Court’s jurisprudence. It isn’t even accurate to describe mandatory arbitration as a ‘justice system” because its goal is finality – not necessarily reaching the correct result. As the Court announced in Hall Street Associates v. Mattel, under the FAA even facially incorrect legal rulings must stand and the parties can’t even agree to expanded review to make sure the laws of Congress are properly applied. In a voluntary context, parties are free to flip a coin to resolve a dispute or agree to be bound by an incorrect ruling. But in a non-consensual setting, the weaker party is being deprived of the ultimate substantive right – the right to have statutes that were passed for its protection interpreted and enforced correctly – in other words, due process. Asserting that arbitration is ‘just another forum” disrespects the very reason for the creation of a public court system and the Supreme Court itself since arbitrators are not even required to properly apply Supreme Court precedent. An agreement to arbitrate involves the waiver of several constitutional rights: the First Amendment right of petition, the Fifth Amendment right to due process and the Seventh Amendment right to a jury trial. And to be sure, there are numerous statutes that expressly provide for the right of access to a federal court, which is obligated to follow the law. But incredibly, the Supreme Court has never acknowledged the waiver of constitutional rights inherent in an agreement to arbitrate and has never specifically considered the constitutionally required standard for such a waiver. In every other context, the waiver of those rights must be ‘knowing and voluntary’. The Court has repeatedly avoided this required analysis by ignoring the issue of consent entirely or by falsely proclaiming that the FAA requires courts to treat an arbitration clause as it would any other contract. The FAA contains no such mandate, nor could it. It is a mere statute and does not have the power to reduce the constitutionally required standard for the waiver of constitutional rights. When Congress passed the FAA in 1925 its express intent was to “permit” courts to enforce voluntary and otherwise valid arbitration agreements as they would other contracts. It certainly did not, and could not, mandate them to enforce involuntary and non-consensual waivers of constitutional rights. The FAA is only constitutional to the extent the underlying agreement is knowing and voluntary. Aside from the magical preemptive powers over state laws bestowed upon it, the Court has also granted it the power to trump the most fundamental dictates of the U.S. Constitution. The surest way to fix much of what is wrong with the Court’s arbitration jurisprudence is to acknowledge that the order compelling arbitration and the entry of judgments obtained in arbitration are forms of state action in the performance of a traditional “public function.” The Court needs to distinguish between truly voluntary agreements and “adhesion contracts,” which are really just a privilege extended to businesses to facilitate the inclusion of normal and customary commercial terms into a routine transaction. Adhesion contracts, especially in the employment context, are simply not sufficiently voluntary to support the waiver of constitutional and statutory rights. Adhesion contracts in most contexts are considered “procedurally unconscionable”. “Procedurally unconscionable” is the opposite of knowing and voluntary, and although an adhesion contract might be a vehicle for setting normal commercial terms, it can’t be an appropriate device for the forfeiture of constitutional and statutory rights. The employment relationship is unique. The NLRA, the Norris LaGuardia Act, and numerous other federal statutes acknowledge both expressly or impliedly that agreements between companies and individual employees required as a condition of employment are not really voluntary. Indeed, most of these laws were passed because of the failure of the free market to protect workers. It is interesting to compare the Court’s concern with the newly required “knowing” consent to class arbitration in Stolt-Nielsen S.A. v. AnimalFeeds International and Concepcion (when the issue is whether or not the corporation that created and crafted the arbitration agreement agreed to class arbitration), with its total lack of concern with consent when it is a consumer or employee objecting to the forced arbitration. Similarly, the Court doesn’t hesitate to declare that arbitration is favored and ‘just another forum” with no impact on rights when it is imposed on a consumer, but at the same time to declare it a wholly arbitrary and inadequate process for the resolution of class actions – as Justice Scalia wrote in Concepcion. Legal historians and academics are already looking at the Court’s arbitration jurisprudence as one of the low points in the Court’s history. And in that review, Concepcion will certainly be the lowest point . . . so far. In Concepcion, the Court spent most of its time explaining that it was improper to force a company to arbitrate a class action because of the deficiencies of arbitration – even though the lower court had done no such thing, but had instead merely held that the class action should proceed in court. The Court violated the express terms of the FAA and preempted state law protections of general application against unconscionable and unfair arbitration agreements and replaced them with nothing. It shockingly expressed concern for the unfairness to corporate defendants of having to be bound by an incorrect result while inflicting that unfairness on consumers and employees without any concern whatsoever. Mandatory arbitration is a cancer in our justice system based on a phony public policy and legal and factual fictions. In recent years Congress has passed numerous statutes prohibiting mandatory arbitration in many different contexts – for example, whistleblower claims under Sarbanes-Oxley, Title 7 claims against defense contractors, military lending agreements, auto dealer and farm contracts – while also expressly empowering the SEC and the new Consumer Financial Product Agency to prohibit mandatory arbitration clauses to protect investors and consumers. Those, along with the Constitution, are the real contemporary public policies. Public policy may encourage the truly voluntary use of alternative processes but it does not favor coerced and mandatory arbitration. Never did and never will, no matter how many times they say it. This post originally appeared on the SCOTUS Blog on September 14, 2011. Reprinted with permission. 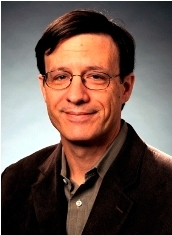 About the Author: Cliff Palefsky is a nationally renowned employment and civil rights lawyer who has argued cases before the Supreme Court and testified before National and State legislative committees. He has been described as a “force of nature” due to his involvement in many of the leading cases and legislation that have come to define the field of employment law. Mr. Palefsky has contributed his knowledge and expertise to drafting the first pieces of legislation concerning worker privacy, drug testing and lifestyle discrimination laws. He is the founder of the National Employment Lawyers Association. Today, Mr. Palefsky serves as a partner to the San Franciscio Bay Area firm McGuinn, Hillsman & Palefsky.